We all heard the story several times that active Managers are not worth the Management Fee they charge you or more nicely phrased Active Manager hardly add value. 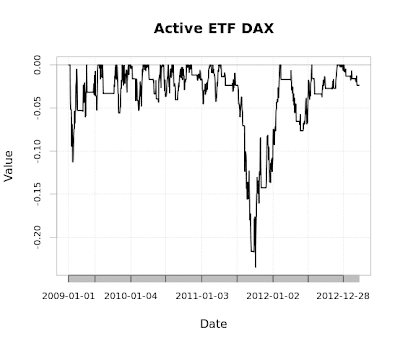 Let's assume our Active Manager is benchmarked against the DAX. 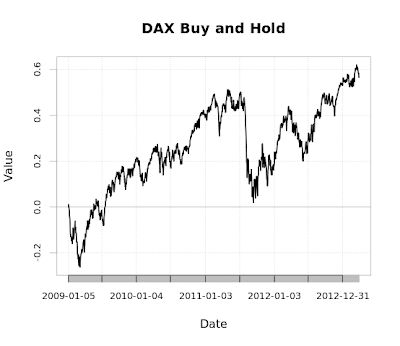 We are investigating if a systematic approach can outperform a buy and hold strategy. As passive security I'm using the ishares DAX ETF (yahoo ticker EXS1.DE) and the daily OHLC from 2009-01-01 until 2013-03-31. The impressive DAX return is almost 11 % per annum. 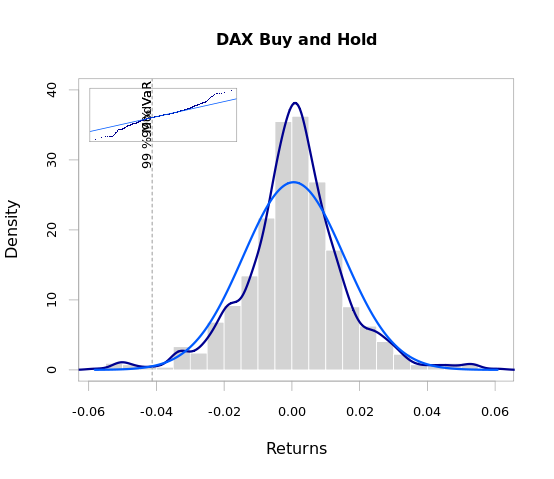 Now, using the great Performance Analytics package we can investigate the daily return series further. 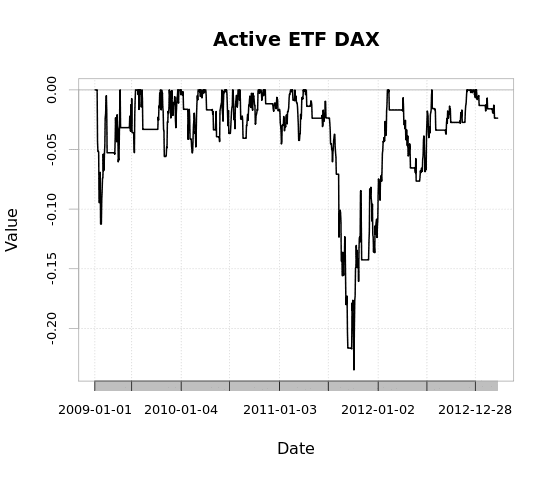 So we have in mid 2011 a significant Equity drawdown. Let's assume our active Manager is using a systematic approach. We all know that riskmodels are safely assuming a rational player as part of the game theory. However, sometimes markets are overreacting and are let's say irrational - that makes it complicated for the risk models and financial math because that is not part of the model. Our active Manager has therefore wisely decided to use the most rational person on his desk to deal with the markets - his computer. 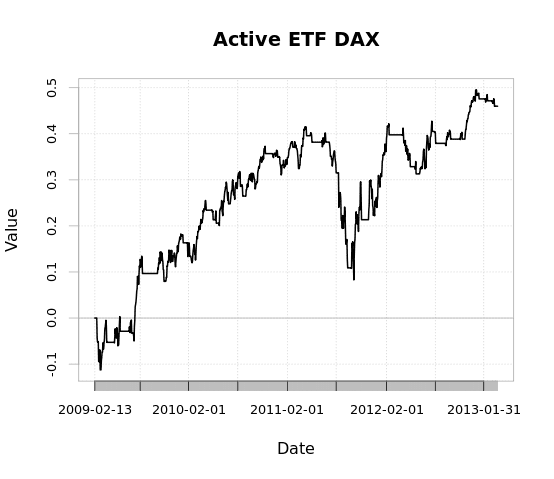 ....and indeed he is returning with his systematic approach 9,5 % p.a. - personally I would have been pleased with his performance - but as a passive investor it appears you are better off with Buy and Hold. Interestingly enough it appears that his VaR is much better. This is also reflected in his return series. 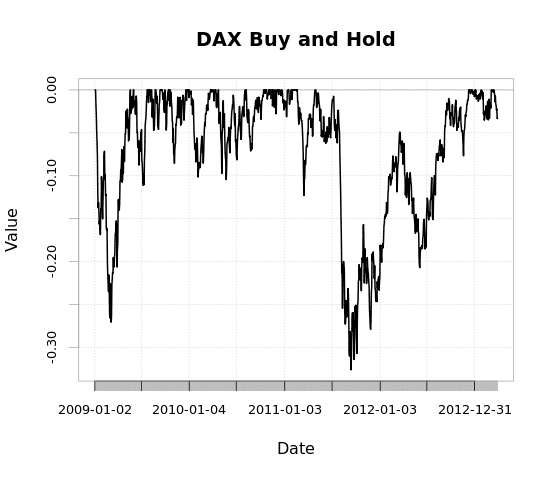 The MaxDrawdown is also better as the buy and hold strategy. But to conclude this post in my example buy and hold is the better option. 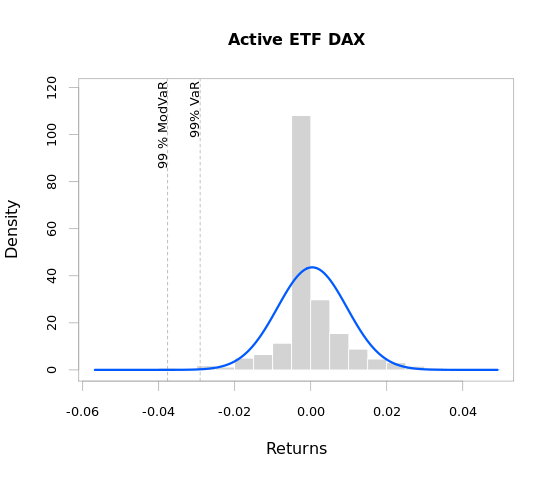 In the next post the active Manager will improve his system and will use a makro-overlay which will bring the number of transactions down from 96 to 50. Let's see where this ends up.